Goals, goals, goals. Someone, somewhere, is always talking about them . . . who sets them, how to set them, when to set them, how to reach them, even whether to set them at all. And now here I am, becoming one of those someones. I’m not going to talk about how to live your best life or out-perform your business competitor, though (which is good, because I don’t actually know anything about either of those things). 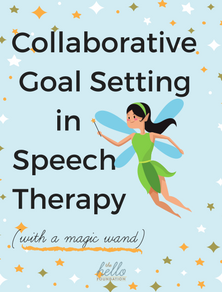 What I am going to talk about is how Speech-Language Pathologists (SLPs) set goals for their clients in therapy, and about how clients can collaborate with their SLPs to set goals that are reachable, meaningful, and, above all else, functional in daily life. So, first and foremost, what’s the deal with SLPs and goals anyway? If you’ve hung out with any SLP for any amount of time, you’ve surely heard them get going about goals. While it is true that we tend to be a goal-oriented-Type-A lot, this really has little to do with our preoccupation with setting (and hitting) targets with our clients. It is, in fact, our training, which teaches us that goal setting and monitoring are the means by which we can measure progress as we help a client remediate his or her area of deficit. Or, in simpler terms, the goal gives us an endgame and a way to get there. The “how” of goal setting is part science and part art. As SLPs, we rely heavily on Evidence-Based Practice (I’ve talked about this here as well), and this is where the science comes in. We use what our science tells us about norms within the general population, the particular nuances of a given communication disorder, and known treatment methodologies and outcomes to develop a reasonable expectation for a client in therapy. The art comes into play when we think about our own clinical experiences, and the client themselves. Here is where I make the argument that no good goal was ever written by a machine and that every good goal was written with client input. I mean, not that there are actual Goal Writing Machines out there, but there have been myriad efforts over the years to standardize the goal-writing process. While there is an element of good in those attempts, they simply cannot stand alone. After roughing-in a goal, SLPs can (and should) look at a client’s day-to-day experience to round it out (EBP also supports collaborative goal setting, FYI). Personally, I like to start the conversation with my clients by asking some variation of the question, “If you could wave a magic wand, what is the first thing you would fix about your speech/language?”, but that’s certainly not the only way to skin this cat. If you’re an SLP reading this, I’d love to hear how you work together with your clients to set treatment goals. If you are a client reading this, know that you can count on your SLP for the science bit. Be prepared, though, to talk about what YOU want out of therapy. What would you do with that magic wand? If your SLP doesn’t ask you, tell them. The two of you should work together to weave together a set of treatment goals that are both functional to your life and based on science. When you’ve done that, you can enter the therapeutic process together knowing that you’ve both got your eyes on the same prize.